Lebanon, a country in Western Asia bordered by Syria, Israel, and the Mediterranean Sea has a total land area of 4035 square miles and a population of over 4.22 Million. Lebanon is in the final phases of revival from its 2006 war with Israel. It enjoys moderate Mediterranean climate. Major agriculture produce are apples, peaches, oranges and lemons. The predominant sectors of its economy are tourism, agriculture and banking. Reassembling and packaging imported parts is the only industry worth a mention for the area. While the summer months (June through August ) are preferred by the visitors, the country is at its best in May and October. Lebanon is rich in historic landmarks and ruins. There are also many World Heritage Sites to delight visitors. 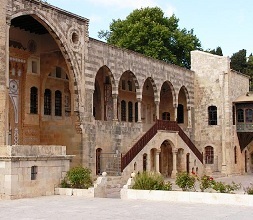 The major attractions are Anjar, Baalbeck, Beirut, Beiteddine, Byblos, El Qamar Holy Valley, Sidon and Tripoli. Lebanese cuisine is a feast for the eyes as well. A colorful array of vegetables, fruits, fish, flat-bread, and rice alongside hummus or baba ghanouj make for a typical meal. Lonely Planet Syria and Lebanon 978-1741046090 $19 Lebanon coverage starts at page 240 and continues through page 380. A traveler’s introduction along with Culture and Environment sections followed by sections on Beirut, and Mount Lebanon and the Chouf Mountains. Good overall information but lacks depth. Lebanon Globetrotter Travel Map 978-1847736345 $9 1:215,000 Scale. The first stamps of Lebanon were a set of fourteen stamps released in 1924 that were ‘Grand Liban’ and denomination overprints on Stamps of France from 1900 to 1921. The set (Scott #1 to #14) catalogs for around $40 mint and around half that for used. Lebanon became a part of the French Mandate following World War I. Overprints on French issues were the only stamps issued by Lebanon until 1925. The first original issues of Lebanon were a set of thirteen stamps released in 1925 showing local scenes. The set (Scott #50 to #62) catalogs for around $35 MNH and $10 used. The designs show Cedar of Lebanon, View of Beirut, Crusader Castle at Tripoli, Beit-ed-Din Palace, Temple of Jupiter at Baalbek, Mouktara Palace, Harbor of Tyre, View of Zahle, Ruins at Baalbek, Square at Deir-el-Kamar, Castle at Sidon, and Square at Beirut. The Cedar of Lebanon is a popular theme on Lebanese stamp issues as the country’s national emblem. Lebanon had many forests of cedars but the resources have been depleted due to uncontrolled logging. Baalbek is a place famous for ruins of the Roman period. They are considered among the wonders of the ancient world. Surcharge overprints along with certain ‘Republique Libanaise’ overprints formed the major stamp issues of Lebanon during the period till 1928. A couple of sets showing local scenes were issued during the period till 1937. Those sets (Scott #108 to #113 and #114 to #134) are all valued high and catalog upwards of $50. Lebanon released another set of fifteen stamps during the period from 1937 to 1940. The set (Scott #137 to #143D) catalogs for around $14 MNH and $5 used. The designs show Cedar of Lebanon, President Emile Edde, and Dog River Panorama. President Emile Edde was Prime Minister of Lebanon from 1929 to 1930 and President of Lebanon from 1936 to 1941. A set of ten stamps released in 1948 showing the Cedar of Lebanon emblem and the Zubaida Aqueduct. The set (Scott #210 to #219) catalogs for around $70 MNH and $5 used. The Zubaida Aqueduct portrayed is the ruins of the Roman Aqueduct built in 273 AD consisting of a series of arches. A set of six stamps released in 1965 in the Birds theme. The set (Scott #434 to #439) catalogs for around $35 MNH and around a dollar for Used. The designs show bullfinch, European goldfinch, hoopoe, rock partridge, golden oriole, and European bee-eater. A set of ten stamps released between 2002 and 2003 in the History theme. The set (Scott #562 to #571) catalogs for around $30 MNH and $25 used. The designs show Old Souk of Zouk Mikael, Old Souk of Sidon, Byblos, Souk of Tripoli, Bziza, Arqa, Niha, Mousailaha Citadel, Libanobythus Mikii, and Nematonotus Longispinus Fossil. Earliest known settlements in the area dates back to 5000 BC. In comparison, fish fossils from the area date back to the middle Cretaceous period (145 to 65 million years ago). The first coins of Lebanon were French Protectorate Era Aluminum-Bronze Piastres (100 Piastres = 1 Livre – Pound) released in 1924. The issues had high mintage (over 1M) and catalog upwards of $50 in UNC. The design showed Cedar Tree in Obverse with Value flanked by stars in reverse. Republic Era Standard Coinage was introduced in 1955 with the introduction of Aluminum-Bronze Piastres in 1955. That issue along with variants that have a hole in the middle have high mintage (over 4M) and catalog for a few dollars in UNC. Gold Proofs with low mintage were first issued in 1980 to commemorate the 1980 Winter Olympics. Coins $2 and up Recent UNCs,common issues from the 1950s onward in VF, etc start around $2. Scarce Silver UNCs from the 1950s start around $10. High Value Silver UNCs, year sets, etc start around $30. Silver Pieforts, Recent Rolls etc go into the 100s. Certain gold commemorative proofs go into the 1000s. Paper Money $2 and up Common UNCs from the 1980s onward starts around $2. High Value UNCs start around $10. Recent bundles, very high value UNCs, etc start around $50. High Value Bundles, Rare Dates, First and Low Numbers, Specimens, etc go well into the 100s and 1000s depending on rarity and condition. Leather goods, woodcarvings and chocolate are typical souvenirs of the place. Antiques $10 and up Early 20th century maps start around $10. 19th century lanterns, 18th century and prior maps, etc start around $50. Art $10 and up 19th century photo prints and travel posters start around $10. Koroleff and David Roberts lithographs, Cuban political posters etc start around $50. 18th century antique prints and original works start around $100.